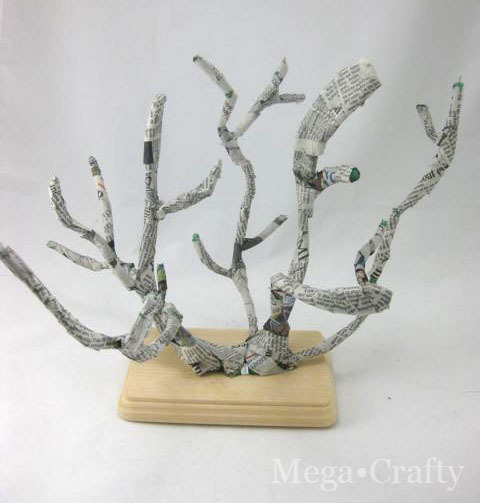 Thanks to those of you who popped over to the So You Think You're Crafty site and voted! Even if your vote didn't end up being for me- I'm just happy for your support in general. And glad that you got to see the wonderful projects by all the crafters who auditioned! I'm thrilled to say that I made it in! And now that voting is over I can reveal that... the DIY Coral was mine. Judging by the audition crafts, it'll certainly be stiff competition this season! I'm looking forward to it and can't wait for the start of SYTYC season 12 in a few weeks. 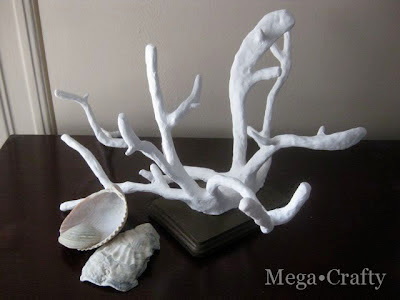 And in case you're wondering, here's how I made the DIY Coral. Each step is pretty easy. But takes a few days to complete because of the drying time involved. Honestly the most difficult part of the project was trying to write this tutorial because so much of how I shaped the coral was just by feeling and eye. I'm really happy with the results, and it cost a fraction of what faux coral from a catalog would have been! 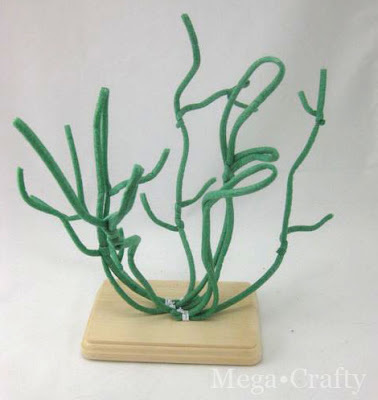 Step 1: Create a coral-shaped armature by attaching the wire to the wooden base. First I cut 2-3 lengths of wire about twice as long as I wanted my coral to be. I folded them in half and put them roughly in the middle of the wooden base. Then I hammered a staple into the center to secure the wires in place. 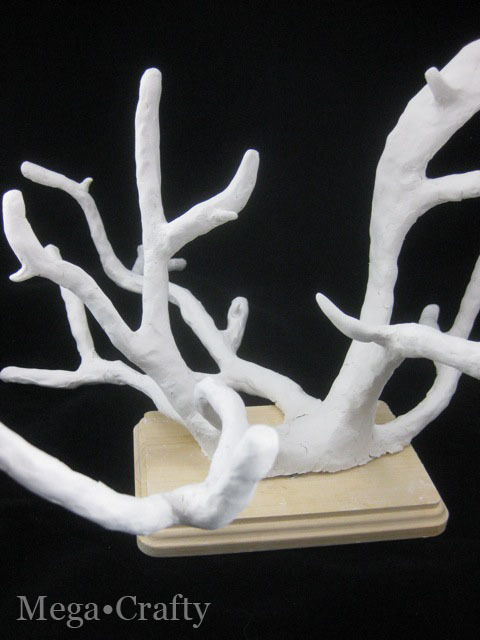 Once the wires were secure I bent and shaped each "arm" into something that looked coral-like to me. Tip: It helped me to look at picture of real coral before I started. Step 2: Adding Thick and Small "Arms" to the Coral. For thick arms cut a length of wire twice as long as you need. But this time instead of folding it in half, twist it around itself at the bottom and create a loop towards the top. These pieces are better for standing straight up since the double layer of wire holds the layers of paper, glue, and clay better. Attach to the base using staples, and shape however you'd like. You can also add smaller arms or limbs coming off of the main wires by wrapping short lengths of wire around them. Rip newspaper into long thin strips. About half and inch to an inch wide and three to four inches long is good. 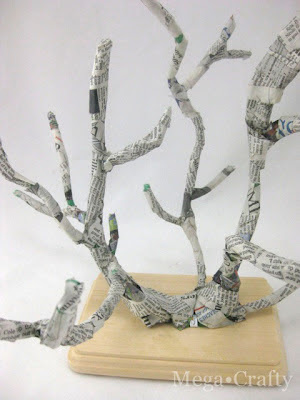 Tip: When doing papier-mâché it's better to rip the paper instead of cut it with scissors. Torn edges will lay flatter and blend better than cut edges. Dip into glue (recipe below) and use your fingers to scrape of any excess. Begin wrapping the wire arms with the paper strips. To build up the base (and help the wires stand to the weight of the paper up better) I wrapped several of the wires together at the bottom with longer strips. The papier-mâché process is pretty organic- there's really no way to do it wrong. Just go with whatever feels right and looks good to you! Once you have the wire covered with a layer of papier-mâché set aside to dry. When it's dry cover it with two more layers, setting it aside to dry between each one. When the third layer of papier-mâché is dry it's time to cover with coral with paper clay. If you've never worked with paper clay before it's very smooth and pliable but starts to dry very quickly. It's helpful to work with small chunks at a time while keeping the rest sealed in a plastic storage bag. It's also helpful to keep a small bowl of water handy to dip your fingers into. Be careful not to use too much clay, otherwise it will be very heavy and lumpy. It will also be crack more while drying. You only need enough clay to easily cover the surface of the newspaper. 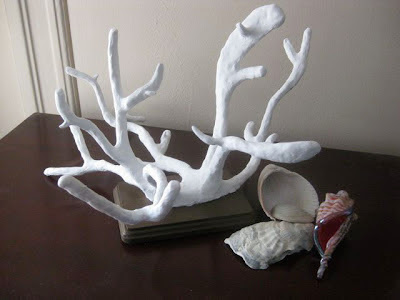 I made more small arms (less than an inch and a half) coming off of the coral by adding extra clay to the surface and pinching it out into the shape of an arm. Before setting aside to dry, smooth out the surface as best as you can. Wetting your fingers down with a bit of water and running over the surface of the clay helps. When the clay is dry you'll likely have a few places where it's cracked. If that happens you can go back and smooth them over with some clay and water. 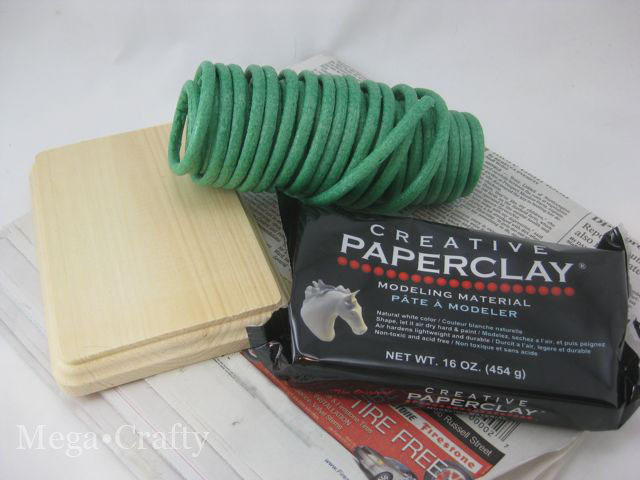 Tip: If there are any spots that are too lumpy you can sand the dried paper clay to get a smoother surface. Paint the coral white and the base a dark brown. When the paint is dry cover the base with a gloss or semi-gloss. Leave the coral flat. You could experiment with different colors and finishes. Orange glossy coral on a stained wood base could be really fun! There are tons of recipes online, some use flour instead of glue, which is less expensive, but take a little more time because you have to cook them on the stove before using. Congrats! That is an excellent project! congrats! this is the one i voted for! Your coral looks very much like real branching coral! I just love how beautifully it turned out. You are too modest - shape by feel and eye! I am pretty sure any attempt i made would be looking more like a tangle of worms! Congratulations for being voted into the SYTYC hall of fame! You certainly deserve to be there! Keep us posted. Congrats on SYTYC! The coral looks very realistic - very cool.